Comments - Terrific scene of courtesans in the Banka-ro teahouse in the Foreign Quarter enjoying pastimes. 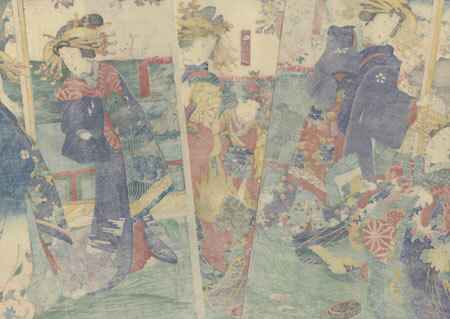 At lower left, a beauty looks up from painting a fan, two brushes in her hand and dishes of pigment, water, and an inkstone on the floor nearby. 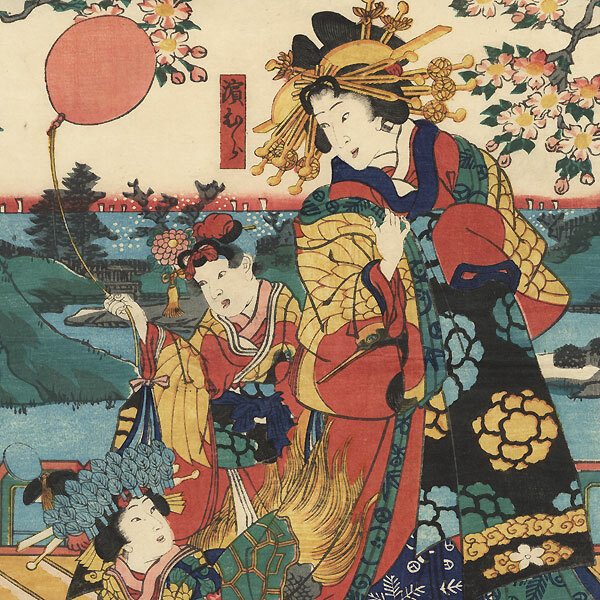 At bottom center, her kamuro or child apprentice holds another folding fan, smiling up at an elegantly dressed courtesan. The young girl behind her holds a balloon. The room opens onto a lovely view of a garden with a pond framed by blossoming cherry trees with the ocean in the distance. A charming design with wonderful color and detail, also in the collection of the Museum of Fine Arts, Boston. Condition - This print with excellent color and detail as shown. Three separate panels. A few holes and thinning spots, small losses at corners, repaired. Slight soiling, a few creases. Please see photos for details. Good overall.